At our office, we specialize in the medical treatment of foot and ankle disorders. If you are experiencing any form of foot & ankle pain, we encourage you to call our office today to schedule an appointment, so that Drs. Lants & D’Amato can evaluate and determine the best treatment option for your condition. We also accept cash as well as personal checks as a form of payment. 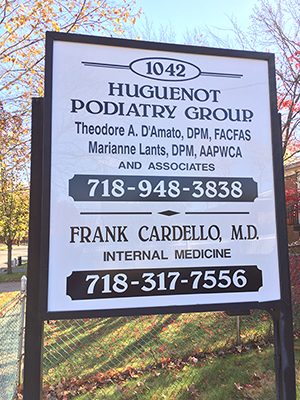 Our office is located at 1042 Huguenot Avenue, Staten Island, New York 10312 with patient parking available in our lot. We are easily accessible by public transportation. For directions to our office, please click here.